We have a very special Blog Hijack with the help of our sister site Reality Ace! Meg Maley, one of the stars of Big Brother 17, is here to share information about her NYC Meet & Greet in support of the Arthritis Foundation. The event will feature a mix of Survivor and Big Brother contestants including Survivor: San Juan Del Sur and Broadway stars Josh Canfield and Reed Kelly! 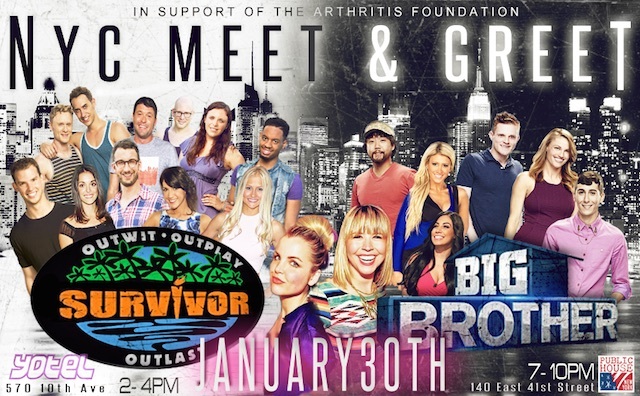 On January 30th, Big Brother meets Survivor in NYC! Meg Maley and Andrea Boehlke are teaming up to throw a Meet and Greet for fans in Manhattan in support of The Arthritis Foundation. Join us in the afternoon from 2-4pm for a family-friendly meet and greet where autographs and pictures are more than welcome (kids under 16 free)! We invite you to come party with the cast from 7-10pm at the Public House, with drink specials all night ($4 beer, $5 wine, and 6$ well drinks!). WHO will be attending?! Guests will be announced as we confirm up until the event..but don't worry we got some fab people lined up for you!! Proceeds and donations will be going to the Arthritis Foundation, leading the fight for the arthritis community. With more than 50 million Americans with arthritis, and 300,000 of them children, the arthritis foundation works to not only find better treatments and a cure but also to provide resources, access to optimal care, and a way to connect with others. For an exclusive interview with Rob Cesternino about the event, visit robhasawebsite.com.